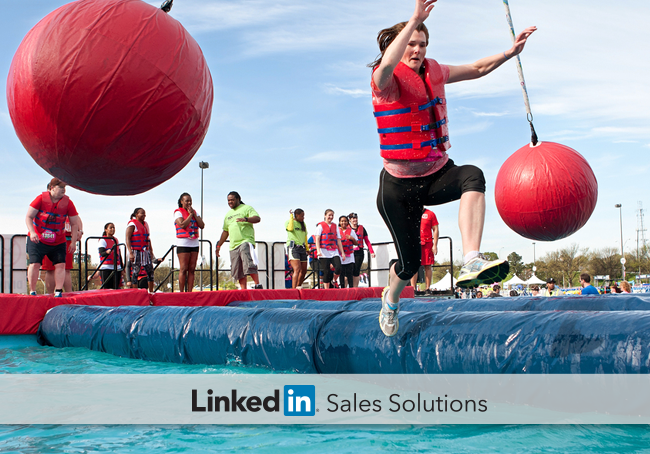 Getting started in social selling can feel like a tough obstacle course. Help them win the trust of decision makers and get the sale with these social selling tips. Obstacle course races are all the rage right now. Why run a boring 5K when you can spice it up with mud pits, walls to climb and live electrical wires? But even though races like the Warrior Dash look intimidating, they’re actually a lot of fun once you know the tricks to succeed. For many budding salespeople, jumping into a new social sales position is like lining up at the starting line of a tough-looking obstacle course. Their goal is to build the relationships with high level decision makers that lead to sales. In their way, however, is the Decision-Maker Challenge - a series of mental and physical obstacles that every salesperson must overcome before landing the sale. Here’s how to arm your budding salesperson with LinkedIn social selling tips so that they can successfully navigate the Decision Maker Challenge. This murky maze is grey and dark with no clear way forward. Opportunities lay around every corner, but how does a new salesperson know which ones are worth spending effort on – and which are just dead ends? Help them find their way by starting the budding salesperson off with Premium Search features that lets them search over 300M up-to-date profiles by seniority, location, function, etc. Then, Sales Connect’s Lead Recommendations will help guide the way with suggestions for new prospects based on the type of leads your salesperson saves. This towering wall blocks the way just when your new salesperson thinks they’ve identified great prospects. Formed of an unbreakable clear substance, it tauntingly shows the prospects on the other side. Whether a new salesperson jumps, climbs, rain dances or weeps, they just can’t make it up and over. This is an obstacle that can’t be surmounted alone – instead your new salesperson needs a helping hand from coworkers to break through. Call in the reinforcements to help your new salesperson with Teamlink, which filters LinkedIn prospects by degrees of connection and identifies which coworkers can help make an introduction. As soon as your new salesperson knows how to connect with a prospect, they run right onto the narrow Balancing Act. This deceptively simple-looking obstacle fools new salespeople into believing they have a clear path to making a connection. But just like charging onto a tight rope, a single wrong move can spell disaster. Help your budding salesperson strike exactly the right tone with Sales Connect’s ability to see the activity of prospects at their target accounts. By watching Status Updates and the content that prospects post, your salesperson can take insights about their prospect into account when they reach out to form a connection. This final challenge is a tricky assent through a prospect’s sales cycle. Whether your sales cycle is a couple weeks or 18 months, your salesperson needs to keep moving upwards while navigating relationship pitfalls that could send them plummeting back to the beginning. Give them a boost with a Daily Sales Update email about their prospects. Your budding salesperson will not only stay on top of prospect’s Career Updates, but also track shares, when a prospect (or their company) is in the news and new connections they make. This gives your budding salesperson opportunities to reach out with thought-leadership content and stay top of mind until a prospect is ready to buy. A new social selling position can be as intimidating as a tricky obstacle course to a budding sales person. Luckily, the Decision Maker Challenge is only overwhelming at first and social sellers quickly figure out the best ways to overcome each obstacle for the future. Help your budding salesperson succeed with Sales Navigator, a social selling tool that helps them navigate the Decision Maker Challenge better, faster and stronger.